Two MIT officers were injured when a Rhode Island sergeant's gun fell out of his holster, went off as he tried to catch it. Police say the round was discharged inside the bus and hit the ground, sending up debris that hit the officers, who refused treatment. An internal investigation is underway at the Cranston Police Department; the sergeant's name has not been released. 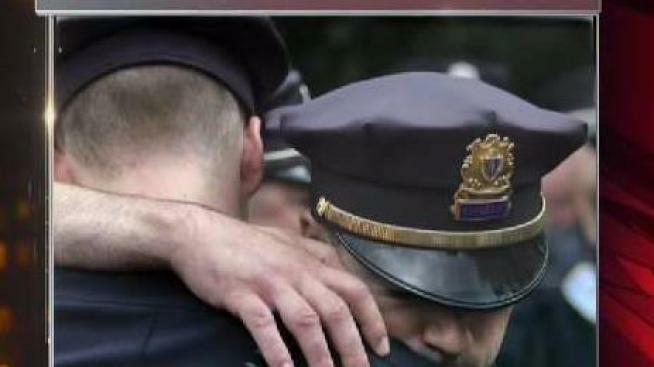 Two police officers from the Massachusetts Institute of Technology were reportedly injured when a Cranston, Rhode Island police sergeant's gun accidentally misfired following the funeral for slain Weymouth Sgt. Michael Chesna. WJAR reports the officer was changing out of his uniform on a parked bus in a staging area for police in Braintree following Chesna's funeral on July 20. The officer's gun reportedly fell out of the holster and went off as he tried to catch it, according to police. Police said that a round was discharged inside the bus and struck the ground, sending up debris that then struck the officers. Police said neither officer was seriously hurt and that both refused medical treatment at the scene. Cranston police told WJAR an internal investigation is underway, and did not release the sergeant's name. The sergeant is reportedly still on full duty and allowed to carry a gun. "Obviously, we take the matter very seriously. We're very happy no one was seriously hurt," Cranston Police Col. Michael Winquist told WJAR. Sgt. Chesna was killed on July 15 after responding to a report of an erratic driver. He was disarmed after being hit with a stone, and the accused gunman allegedly shot him multiple times. A 77-year-old woman was also shot and killed as she stood in her home's sunroom. The suspect has been ordered to be held without bail since his arraignment.